Karen Klassner’s career as an educator, mentor and coach began at Wyoming Seminary in 1971. She took over the Blue Knights’ field hockey team in 1973 and helped build Sem’s program, as well as the entire Wyoming Valley Conference, into a national field hockey hotbed. She currently has a 660-171-46 record with the Blue Knights, 17 undefeated seasons, six state championships, and three state runners-up. Sem’s field hockey field is named Klassner Field in her honor. Klassner served as chair of the National Field Hockey Coaches Association High School All-American selection committee from 1998-2002 and served as president of the State Coaches Association and chair of its All-State selection committee. She was inducted into the Luzerne County Sports Hall of Fame in 2003 and the National Field Hockey Coaches Association Hall of Fame in 2009. 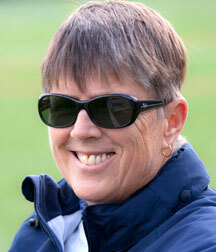 She was named the United States Field Hockey Coach of the Year in 2009. Three of her Wyoming Seminary field hockey players – Kelsey Kolojejchick ‘09, Kat Sharkey ’08, and Lauren Powley ’02 – went on to compete in the Olympic Games and more than 100 of her players have played at the collegiate level. Klassner graduated from Mansfield High School in 1967. She earned a bachelor of science degree in health and physical education and recreation from Lock Haven in 1971 and she earned her master of science degree in education from State University of New York, Cortland, NY. She is a health and physical education teacher at Wyoming Seminary and has been the school’s Director of Athletics since 2001. She also served as the school’s Assistant Dean of Students for three years and as Dean of Students for 12 years. In addition to field hockey, she also has coached swimming, basketball and softball at Sem. She is a recipient of the Sem’s prestigious Maslow Upper School Award for Excellence in Teaching.